Anyone who reads here / follows me on social media / has met me, ever, knows that I’m a little bit animal crackers in general, and kitty mad in particular. I’ve always loved cats. I love other animals too (dogs, otters, sloths, badgers, penguins…. ), but cats have long had my heart. I grew up with cats and their sweet, funny, independent, slightly potty natures, and they’ve been the little pawprints by my side for many years. Our first cat was Moshe, a friendly black and white moggy who was already on the scene when I arrived. Moshe was the best cat (this will be a theme. All my cats are the best. Your cat is probably the best too! ); soppy and devoted and the perfect playmate for an only child (as I was then). She also had the patience of a saint, putting up with many an hour of tea parties / dress up / rides in my doll’s pram, with the loyalty and temper of a guard dog (once having to be detached from the leg of a friendly local postie who came a little too close to my pram as I napped, apparently). When we moved across to Germany the quarantine rules would have had her separated from our family for almost a year, so rather than putting her through the stress of that, we left her with my mum’s friend and her family, who we’d been very close to. Moshe thrived there and lived out her days in peace, utterly beloved, for many years. While we were in Germany, we had no cats. The RAF ex-pat life and being in a new country precluded pet ownership, and I think we all would have felt a little disloyal to Moshe if we’d got another pet. Five years later we moved back to Scotland again and discussed getting a cat at some point, in the future. When we first moved back to the UK we were renting temporarily, so it was hardly a great time to get a pet, we thought. Fate had other ideas. One chilly, snowy day my mother was walking to the store after dropping off my siblings at school (I was away at boarding school, so was party to this tale through letters and phone calls. So 90s, so pre-internet), when she heard a little mewing. The high pitched sound attracted her attention and my mum looked around the car park outside the shop to see where the sound was coming from. After a little investigation she found a tiny grey tabby kitten, curled up beneath a lorry. She bundled up the wee mite and took him home. A little investigation (ah, the joys of village life) revealed that he had been a Christmas gift a child had tired of….and this cruel fact was just the red flag my mum needed to make up our mind. He was our cat now! Sam was the soppiest, most placid, and adorable cat ever. Muscular, sturdy and deep of purr, he was the perfect companion and was the family favourite by oh-so-many miles. We all loved him to pieces and he was the gentlest, sweetest (and often silliest) fellow. He was part of our family for nearly twenty years and we were all very lucky to have a cat like him. What a gift. As soon as Matthew and I bought our own home, we knew we wanted cats of our own….and Poppet, Leela and Fry have been part of our family for nearly four years now. I’ll be writing an update on the trio of trouble soon, but for now I think I’d better get to the actual ‘book review’ part of this book review, haha! I’ve been following Tom Cox on twitter for ages, and love the tales of his many kitties, the good, the bad, and the sad. I was delighted, then, when a friend gifted me Under The Paw, Tom’s first book about the adventures of cat ownership. A memoir with many cat stories and a fair few lists, I loved this read, both learning more about Tom’s life and the cats he has owned. I found myself nodding along to sections, and with tears in my eyes more than once when he recounted cats lost. 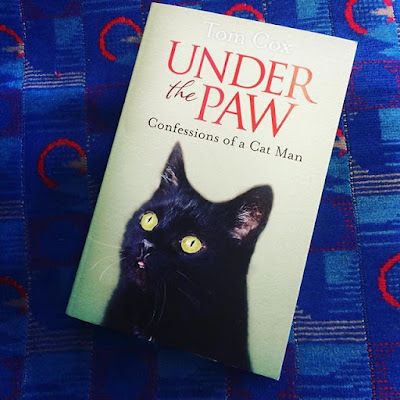 There’s a section about a cat who they (Tom & his wife) couldn’t adopt (for reasons fully explained in the book – no spoilers here, my friends) where Tom writes of his hopes for the kitty and the life he hopes they get to have that genuinely made me weep. These little creatures, man. There’s lots of fun here too, and I enjoyed the parts where Tom writes from a cats-eye view. With six cats in the family there’s plenty of scope for fallings-out, adventures and sweetness. I’d heartily recommend this book to any cat-lovers, or to anyone who enjoys a good memoir – I love reading about the twists and turns of the lives of others. Tom Cox is a great writer and conveys the beauty (and the angst) of the everyday with a skilled and measured tone. I’ll definitely be looking forward to more of his writing in the future.